Emerald Paving Inc. "The Paving Professionals"
Emerald Paving, Inc.'s employees are highly skilled professionals who take pride in customer satisfaction. Since 1983 Emerald has constructed numerous paving projects from the Cascades to the San Juan Islands. Emerald's grading and paving projects include: Commercial, Industrial, Public Works and High End Residential. We also provide clients with design and construction of parking lots, tennis courts, running tracks and 5 foot to 9 foot machine laid asphalt pathways for parks and golf courses. Emerald Paving, Inc. is a paving and grading contractor specializing in the construction of parking lots, tennis courts and driveways for commercial, industrial, residential and public works markets in the Puget Sound area. The safety and health of our employees is of paramount importance. The Emerald Paving team spirit of quality service to the client is reinforced by our sense of integrity and honesty, while making a reasonable return on our investment. Please navigate through our website and check out the quality, specialty service we provide. Contact us via email or phone to request a quote; we look forward to showing you we are "the paving professionals". 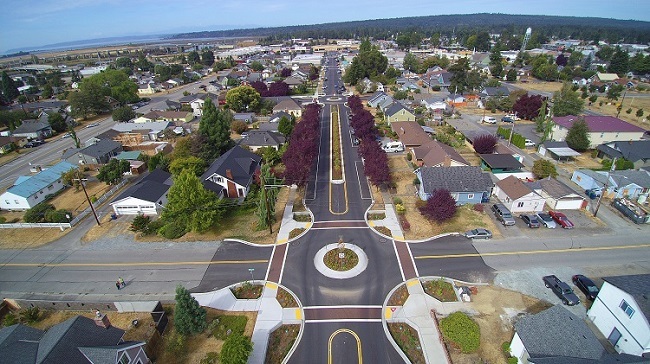 Below is a traffic calming and parking revisions project we did on 3rd Street for the City of Marysville, WA. The crosswalks were done in StreetPrint in an Offset Brick pattern with StreetBond in Brick Red by Emerald Paving, Inc. Check out more pictures of projects we've completed in our gallery!